The market of Internet of Things applications is growing at a constant pace. As a result, design engineers require a flexible solution that can be easily and quickly adjusted to more and more complex requirements. To meet this demand, Renesas has developed the Synergy™ platform. It provides system developers with an innovative approach to start product development directly at the API level, thus reducing the time for developing and designing new features. In this Online Training, you learn how to control your Synergy Board from anywhere via a web browser. Network protocols and services like IP, ARP, UDP, ICMP, DNS, DHCP, TCP, HTTP and Packet Pools are elaborated on, so you are ready to build your own the Express Logic NetX application scenarios. After successfully taking part in the seminar and performing the related excercises, you will be granted the MicroConsult Training Certificate. 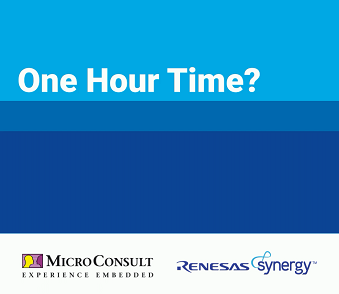 The Renesas Synergy™ Online Training "One Hour to the Cloud" addresses embedded software developers, software architects, technical support and application engineers.